Provide comfort for the family of Thomas Smiley with a meaningful gesture of sympathy. BREWER – Thomas Smiley, 65, passed away February 28, 2019 at his home in Brewer. He was born October 21, 1953 to David Oakman Smiley, III and Arline (Merrill) Smiley. Tom was a graduate of Brewer High School, class of 1972. 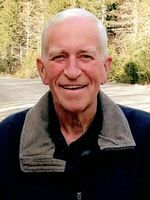 After high school he stared in the auto parts business and worked in the Brewer/Bangor area as an auto parts salesman for 46 years. Tom’s hobbies included woodworking, hiking, camping, and sailing with family and friends. He is survived by his wife of 40 years, Deborah; son, Jonathan and his wife, Laurel; her two boys, Jack and Thomas; his sister, Elizabeth Smiley of Abbott; and brother-in-law, Thomas White of Florida. In addition to his parents, he was predeceased by his son, Adam; and brother, David O. Smiley, IV. Provide comfort for the family of Thomas Smiley by sending flowers. Tom and I knew each other most of our lives. Ever since we attended Essex Street Baptist Church as kids. We both graduated Brewer High in 1972. Debbie, I knew you all the way from grade school to high school. Jonathan, you and I worked together for awhile. I'm so sad that Tom is gone. The other John Gray John M.
Debbie, I am posting this one on behalf of my Mom Jean Hews. She is so very sorry for your loss as well. Tom was a very wonderful and kind man with a big heart. We will keep you in our thoughts and prayers. Debbie, I am so very sorry for your loss. I will keep you in my prayers.